“Aren’t you worried it’s going to turn on you and your family one day?” asked a man who had approached me in a park to inquire about the dingo pup resting quietly in my arms. 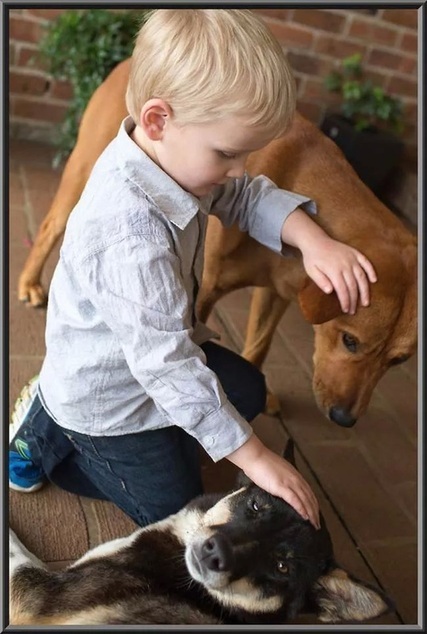 People are often surprised with such a response regarding Dingoes and children. That's because many are not familiar with the nature of dingoes, or the nature of a natural species in general. flight – to hide or run away. A dingo would rather avoid conflict than to engage in it. This natural response is based on wisdom and survival longevity. To avoid a fight is to limit chances of injury which may result in death. Being a natural species, dingoes do not have the same paranoia and instantaneous aggression that fighting dog breeds like bull terriers, mastiffs, bulldogs and shar peis sometimes possess. These breeds of dog were purposely bred for their aggressive responses to stimuli, which made them successful pit-fighting dogs. Comparatively, dingoes are far less confident than dogs. Their natural timidity causes them to respond sheepishly to new situations, crowds of people and excess noise. When faced with a situation they feel uncomfortable with, a dingo’s first response is to run away or hide. injury caused by a dingo there are 5000 injuries from dogs, with 78% of dog-attack victims being members of the dog’s family or a family friend (Sydney Morning Herald, August 7 2013, Robert Zammit, Vineyard Veterinary Hospital). To answer the man’s question at the park, my family, just like your family, are statistically 5000 times safer in the company of the family dingo then they are in the company of the family dog. woman, new born babies, children and infant animals like puppies. gentle and quiet and pose less of a physical threat. These are usually young children and women. Highly sensitive to loud, anxious, hyper or aggressive human personalities and may become distressed in the company of such individuals. more acute than a dog’s. As such, a dingo may easily become overstimulated, and therefore overwhelmed and distressed, when exposed to a multitude of noises and scents like those found in a busy public setting. Like any animal, a dingo should not be forced into a situation that it feels uncomfortable with. If a dingo displays hesitation or discomfort, it should be left alone. If a dingo feels threatened and does not have a clear avenue to evade the situation (flight path is blocked), it may defend itself against the potential threat. Where a flight response in unavailable, a fight response may follow. As an apex predator, dingoes possess a naturally high game drive. This means they instinctively know that their food is sourced from other animals, not from their food bowl (even when born in captivity). With their high intelligence and superior athletic abilities, dingoes will hunt other animals for food. This is not a sign of aggression, nor does it pose a risk to their human owners. Some dingo owners allow their dingoes to fulfil this natural desire, just as Indigenous Australian’s had done for twenty millennia with the dingoes that lived in their camps. Dingoes are known to bring the animals they have caught to their human owners just like a cat may bring its owner a mouse. well with strangers and dogs in public settings like dog parks. Dingoes are not mindless beasts, but highly intelligent and well balanced animals who understand individual situations for what they are, and what is socially reasonable, and expected of them. Their game drive does not make them unpredictable or dangerous towards people. Care should be taken around other pets such as rodents, cats, rabbits, poultry or other forms of food that may be sourced naturally. Some dingoes have been trained to work with sheep, befriend cats, and even protect other pets. This can be achieved through training at an early age. Like with all animals, no training is full proof and supervision is always recommended. Terriers. The Dingoes are allowed to play with the boy, the Staffies are not. 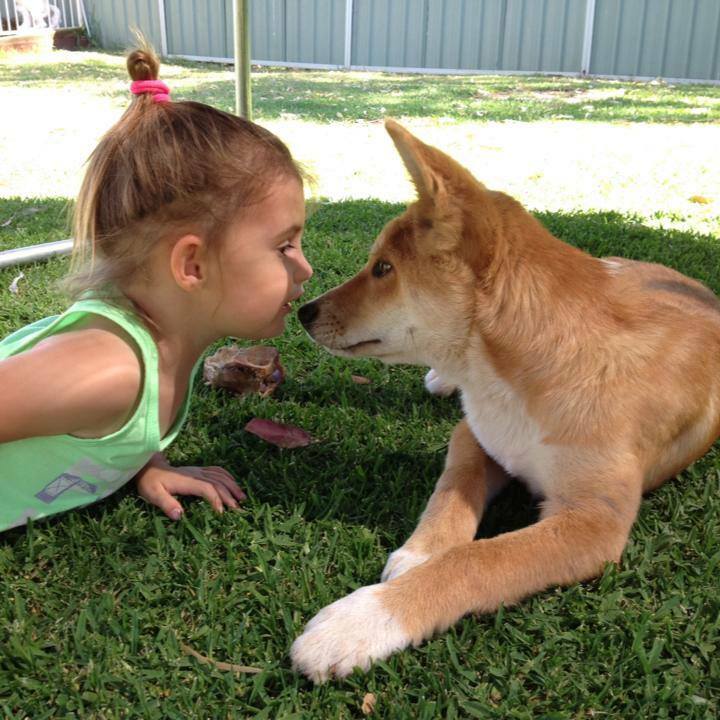 Despite the common misconception, dingoes tend to be intuitively calm and gentle around children and pregnant women. Although this is the first time four year old Deacon has met Blaze and Khya, both dingoes are calm and relaxed in his presence. Dingoes who recognise humans as companions will not hunt humans. Wild dingoes who do not have a relationship with humans may inquire if a human is a food source. Wild dingoes should always be treated with the utmost respect, just as if they are a Lion in Africa, or a Tiger in Asia because they are Australia’s equivalent. This is best achieved by not feeding wild dingoes, or approaching them in any instance. Dingoes have a strict hierarchy and will correct the behaviour of dingoes or dogs that disrespect them. This is not a sign of inherent aggression or instability. It is quite the opposite, with the lead dingo educating the inferior dingo or dog on what is socially acceptable. During breeding season (March - August) female dingoes will typically become aggressive towards other females and desexed males. Male dingoes may become territorial or dog-aggressive once a female begins her cycle. Desexed dingoes may present some forms of aggressive behaviour at this time. Outside of breeding seasons all dingoes tend to be calmer and will socialise more successfully with other dingoes or dogs. It is advised to limit interactions with new dogs during breeding season. enriching companions for those who understand their timid nature and natural desires. Dingoes are a unique animal and do not suit all people. They will flourish with owners who are sensitive, intuitive and possess a high degree of emotional intelligence and awareness. Owners need to be patient and understand that a dingo is a highly wilful and intelligent animal, and must be willing to let their dingo conduct itself in its natural manners where appropriate.